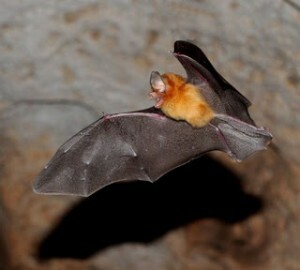 A Hispaniolian funnel eared bat flying in a cave. Photo courtesy Animals Library. Hi everyone! I hope you all had a good week. I would like to dedicate this week’s blog to a good friend of ours who passed away last weekend. He was a really funny man and we always had a lot of fun together. He was like an uncle to me and I really can’t believe he’s gone. So, this blog is for you “Uncle” Chris. We miss you! I read an article about a really cool animal called the Hispaniolan solenodon. Scientists have mapped the solenodon’s DNA and have decided that it was around during the time of the dinosaurs! Since the Hispaniolan solenodon is a really cool animal, I thought I should look up other cool animals that live on the island of Hispaniola. I found one called the Hispaniolian greater funnel-eared bat. The Hispaniolan greater funnel-eared bat has soft fur that is kind of long and is woolly at the base. The top of its fur is light brownish and the base of its fur is pinkish. It also has a bell-shaped structure on its forehead. This bat is only found on the island of Hispaniola and lives in caves. It likes to eat yummy insects. The International Union for Conservation of Nature and Natural Resources (IUCN) has categorized the species as “Near Threatened.” This is because the caves where they live are a fragile habitat. The IUCN has recommended that action be taken to protect the caves. Tourists damaging the cave ecosystems and mining are two big threats to the Hispaniolian greater funnel-eared bat. If you want to read more about this bat, you can read about it here. I’d like to wish everyone a very Happy Mother’s Day! I hope everyone has a nice week. I predict that these bats will be endangered. Soooooooooooooooo sad. i think these bats have funnel shaped ears. or else why are they called “funnel eared bat”? Sorry I didn’t see this. Yes, I think you might be right. The bats are in trouble. Hopefully these bats can be helped before they become endangered. Yes, they have funnel shaped ears. They are adorable! Don’t you think?